Not only is the Absa Campus in central Johannesburg comprised of some of the most eco-friendly and energy-efficient buildings in South Africa, but they are also self-sufficient, thanks to an on-site world-class energy centre and grey water plant. The bank has put its money where its mouth is as an advocate for clean, green, reliable, and economical energy solutions, and has reaped the benefits financially. The sleek Absa Energy Centre is continuously manned from a control room which has a distinct spaceship feel. It is the first site in the world where gas and diesel generators are synchronised, creating enough energy to power up to 2800 houses. Fig. 1: Absa’s energy centre’s engineering team. 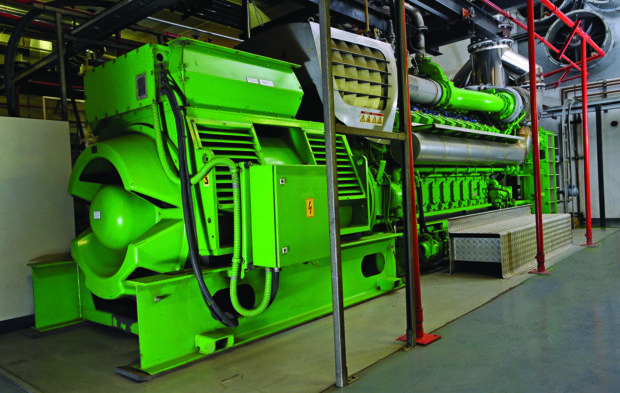 Absa’s inner city power generation plant can generate the maximum demand for the entire campus: 11,2 MW from gas-powered engines which are 70% cleaner than diesel-powered engines by emitting fewer harmful gases into the atmosphere. These gas engines are also better for the environment than the national electricity utility’s coal-fired power stations and the 6 MW of emergency backup from diesel units. Absa’ generation centre has been running in the basement of one of the bank’s buildings since 2010 and is now paid off. There is also enough space available to double its generation capacity in future if necessary. 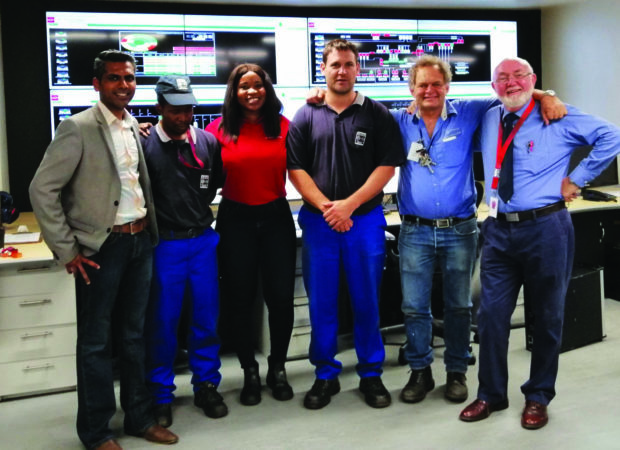 The centre provided power to 12 000 Absa employees in all six buildings in the campus during 2015 when the bank made a business decision to go off the national grid, and also provides business-as-usual conditions during the current load-shedding experienced by the country. This also alleviated power constraints on the local grid which allowed neighbouring businesses to still operate while City Power had limited supply. Fig. 2: One of the bank’s gas-powered generators. 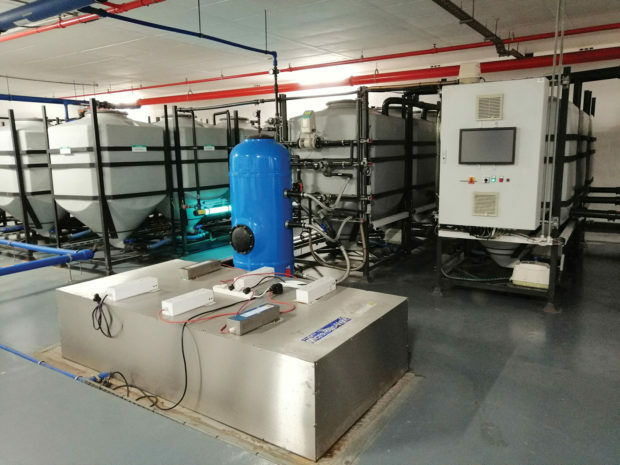 As part of its sustainability programme, the bank also installed two of the largest grey water plants in the country, in office blocks Towers West and North, which can collectively recycle up to 22-million l of water a year. “We collect water from the office basins and showers, it is filtered, and UV lights are used to kill bacteria. It is then pumped into holding tanks and used to flush toilets,” says Aveshen Moodley, Absa’s Vice President of Environmental Sustainability. “It is an energy intensive process, but in an increasingly water scarce world one that pays huge dividends.” The grey water plants, which cost around R7-million each, have already paid themselves off in savings. Johannesburg CBD has a high water table which seeps into the building basements. “We do water quality sampling to see if it’s fresh water, because this can be used within our grey water system,” Moodley says. Fig. 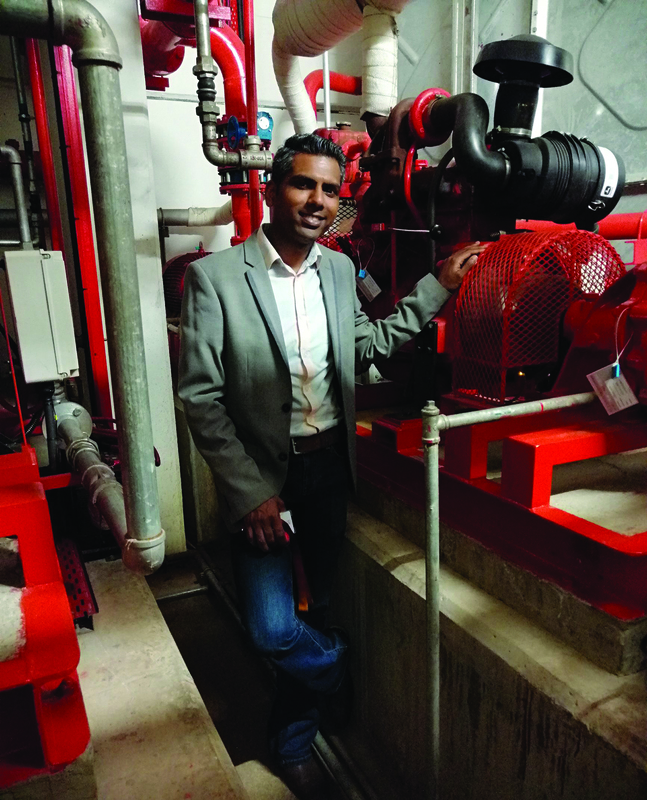 3: Aveshen Moodley at one of the pumps at the grey-water processing plant. Waste heat created by the gas engines is used to heat water for washing dishes and showers, as well as heating the buildings via underfloor heating. Solar energy is the cleanest form of energy and has done wonders for the bank’s carbon footprint. A 400 kWp solar plant, consisting of almost 6000 panels, sits atop a north-facing roof at Towers North. The R10-million plant, which includes a large solar PV system mounted at a height of 7-storeys, was completed in 2013, and paid itself off this year according to the results from measurement and the verification of savings. Fig. 4: The bank’s grey-water processing plant. “This means by the end of this year we will get free energy from the plant, offsetting up to 400 kW of electricity per year.” String inverters convert the energy into usable power. Moodley said the plant, built when the bank was still part of Barclays, was the first in the group globally, and as such the African team helped to write the global photovoltaic strategy. The bank also has a 1000 kWp rooftop solar installation in Pretoria, which provides 17% of that office’s electricity with a single inverter. That R25-million investment will pay itself off next year. “We will be rolling out five solar plants to other offices and trialling battery technology, to be used when we don’t have sunlight. To this end, we are investigating net-zero offices. We are always looking for new technology for our operations, both to save the company money and keep operations efficient, with the added benefit of being good for environment,” Moodley concluded.